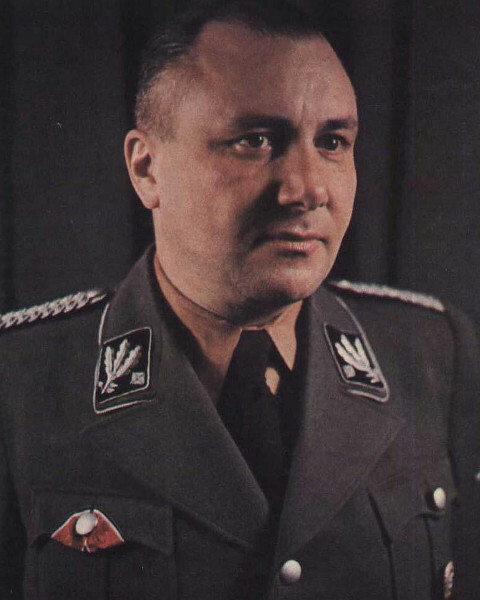 As unpalatable as it may sound today, we all have Martin Bormann, NSDAP Reichsleiter and Hitler’s private secretary, to thank for the entire Kehlstein project. One of the less heralded members of Hitler’s inner circle and the “Obersalzberg set”, Bormann was something of a shady character who operated mainly behind the scenes – a silent operator and professional functionary who would remain both loyal and close to his Führer right until the very end. Of all the Nazi leaders, Bormann’s name was the least likely to have been associated with something as grand as the Kehlstein project. It is somewhat ironic that while the grandiose creations commissioned by the ostentatious Hermann Göring have long since been wiped off the face of the Obersalzberg, the Kehlsteinstraße and Kehlsteinhaus both remain – the impressive legacy of a man known for being little more than a faceless bureaucrat. Bormann was the brain behind the idea for the construction of the house on the Kehlstein mountain and, likewise, it was he who would be ultimately responsible for the construction of the 6.5 kilometre (3.9 mile) long winding road from Obersalzberg to the Kehlsteinhaus car park – known as the Kehlsteinstraße. It is true to say that given the time, expense and labour requirements it could have only taken a man of Bormann’s energy to take the project through to a successful conclusion: as well as wielding considerable influence and displaying what was seen by many as a breathtaking intransigence, he would also prove to be an extremely shrewd businessman. Bormann had been more than familiar with the Obersalzberg region having paid his first visit in 1930 as a guest of Hitler’s younger sister Paula. Clearly drawn by the tranquility of the area and the scenery, by 1935 he had bought his first plot of land. This was followed by his purchasing a number of further plots: it was clear that the Reichleiter was addicted. The ordinary-looking Haus Wachenfeld – purchased by Hitler as a private residence – was transformed into what would soon become the impressive Berghof, and the settlement soon began to mushroom. Construction work began in earnest, with thousands of workers being shipped in to build a number of facilities, guard houses through to what what was eventually to become a Kindergarten. By late 1936 Bormann’s construction plans had started to spread outside the rapidly-growing settlement, resulting in a discussion with the Generalinspektor für das deutsche Straßenwesen (“Inspector General for German Roadways”) Dr. Fritz Todt about the possibility of opening up the northern side of the Kehlstein mountain by road. Todt himself was also familiar with the area, and would sow the seeds of the project inside Bormann’s head by suggesting that such a plan was indeed feasible; had he simply dismissed the idea, it is highly likely that the Kehlsteinstraße would never have been born. So it began. With an enthusiastic Bormann determined to see his plans realised and Todt more than happy to provide his expert support, the project would become a reality. Blasted out of solid alpine rock between 1937 and 1938, the spectacular Kehlsteinstraße is still seen today as an amazing feat of engineering, and is the highest mountain road in Germany. 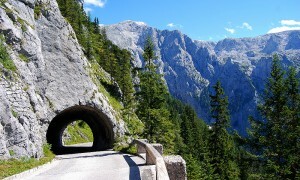 Unlike many similar mountain roads there is only one switchback hairpin bend, and there are five tunnels dotted along the route – the longest being the Südwesttunnel, measured at 150 metres. Did You Know?The winding road leading up to the Kehlsteinhaus from the station at Hintereck has an elevation of 700m over 6.5km, and contains 277 metres of tunnels. Public vehicular access to the Kehlsteinstraße was restricted in 1952, and since then apart from service and maintenance machinery the only vehicles that have been allowed on the road have been the specially-adapted local buses that ferry large numbers of visitors to the Kehlsteinhaus every year. 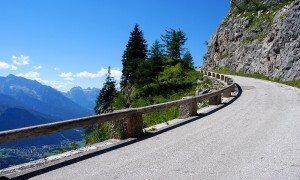 In over sixty years, there have been no accidents: the surface of the road is carefully maintained on a regular basis, and the walls are “cleaned” every year to prevent sudden rock falls.